So, I've had the MantisX for about a week now. I've only had a chance to dry fire with the unit. I haven't taken it out to the range, something about life getting in the way. Anyway, initial impressions are pretty solid. First off, it arrived at my address very quickly. I ordered it July 3 and it arrived the following Wednesday. No special shipping. July 4th was in there, as was one international border, being shipped into Canada after all. There's a short instruction manual get to get you going. Printed on a glossy paper, but it isn't difficult to figure out. 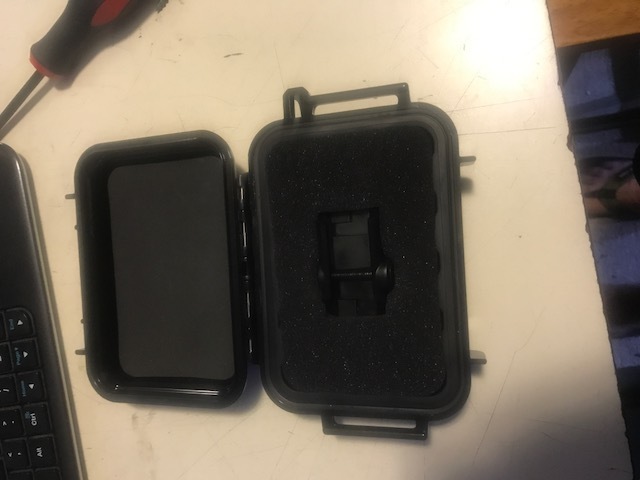 What is nice is the unit is shipped in a genuine, branded Pelican 1010 case, with custom foam inserts. My unit even had enough of a charge to allow me to play with the unit right away. With the unit turned on. In this picture it is still connected to my phone, and is showing the battery is getting low. So, mounting is easy. It's an inch and half long and mounts to a Picatinny rail, with a flat head. You could probably use a coin to attach it. I personally would have preferred hex, but I will admit to being fully weird on that. On my IWI Jericho 941 S, it mounts easily. I have pushed the mount forward closer to the end of the muzzle, mostly because I think it will make the grading of the movement harder. It is very important to note where and how the unit is mounted. THe unit needs to know which way it is facing (forward or backward) and on which rail the unit is mounted (Top, left, right, bottom). This is crucial since the internal magic of the system detects movement so it needs to understand orientation. Once attached you open the software. Turn the unit on with the button and connect through the app. From there you set up what you are shooting. 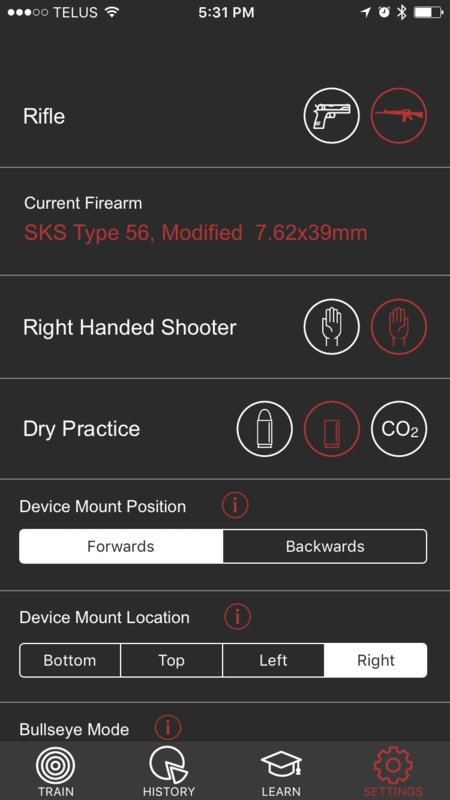 Some firearms are on the drop down list (AR 15) but you can define the firearm yourself. 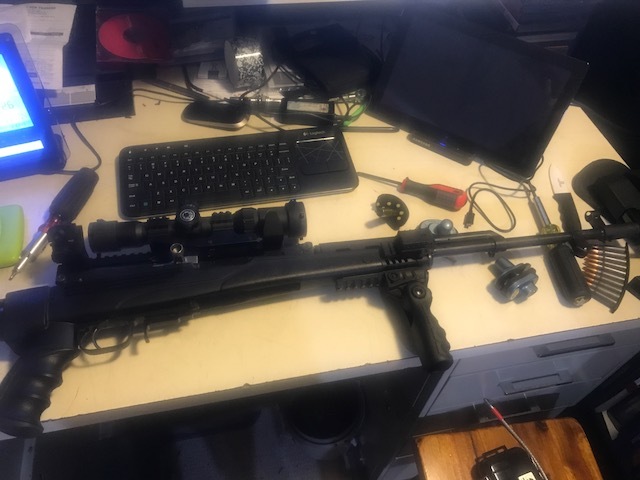 Below are the screen grabs of my pistol and SKS set up. Supported modes of use are Dry Fire, Live Fire and C02. 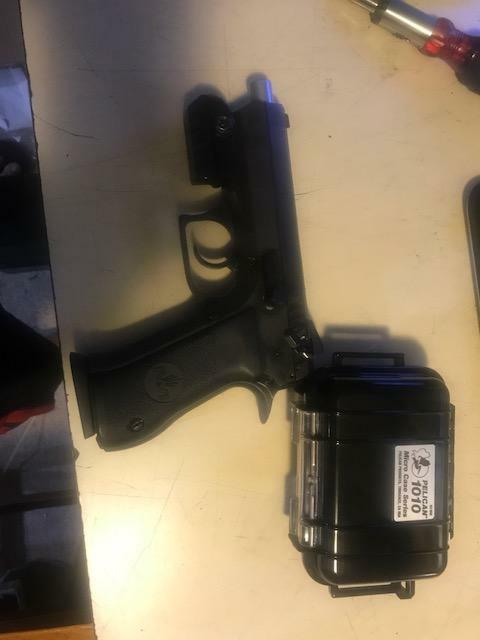 Hopefully, I will be able to test to the CO2 function of the unit the next time I go out for some force on force live fire training, or as the kids call it, playing paintball. The unit also mounted on my SKS, right-hand side. Dry fire is very easy after that. I would say the MantisX picked up at least 90% of my dry fire, if not more. It never registered racking of either weapon as a shot, it would miss a shot rarely on the pistol. So what happens when you shoot? Good quality feedback and coaching. Here I can see how many shots I have taken in this session, and generally what I am doing. 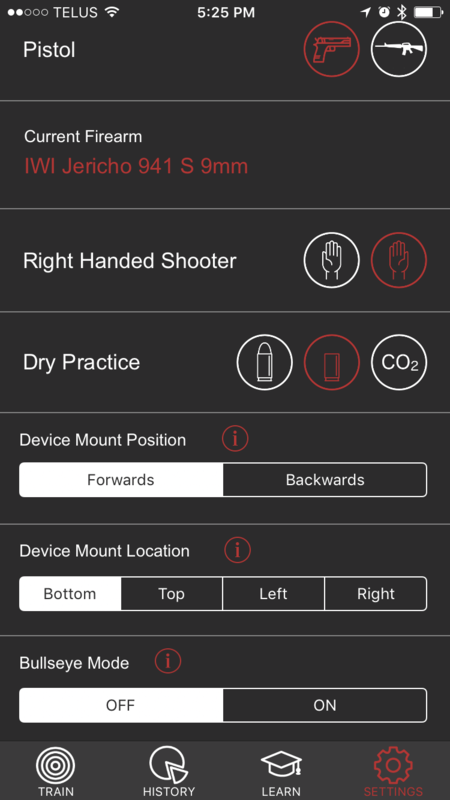 The app offers advice based on what the muzzle of the weapon does, before, during and after the trigger pull and assigns a score, here I was 76.4%. 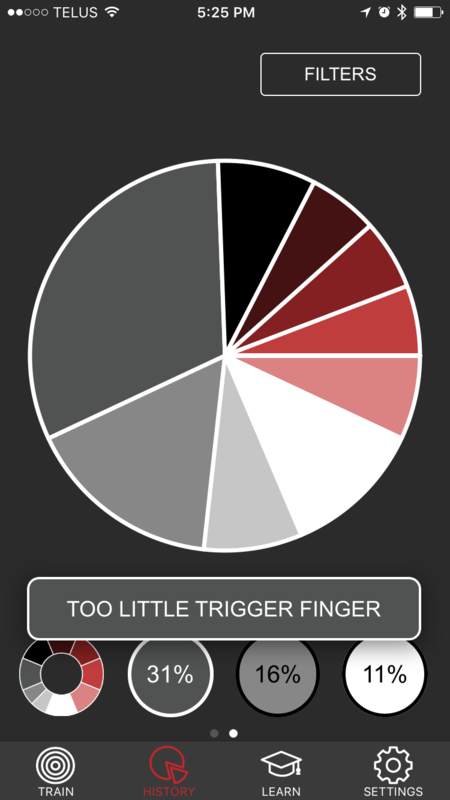 The red outer ring correlates to the recommend corrections, according to this I am pretty guilty of bad fingers. I often have too little trigger finger, and some sometimes I over correct and have too little. Now I know what I should concentrate on as I slow down and think about shooting. This image is the muzzle plot of the shot, scored 72.9%. 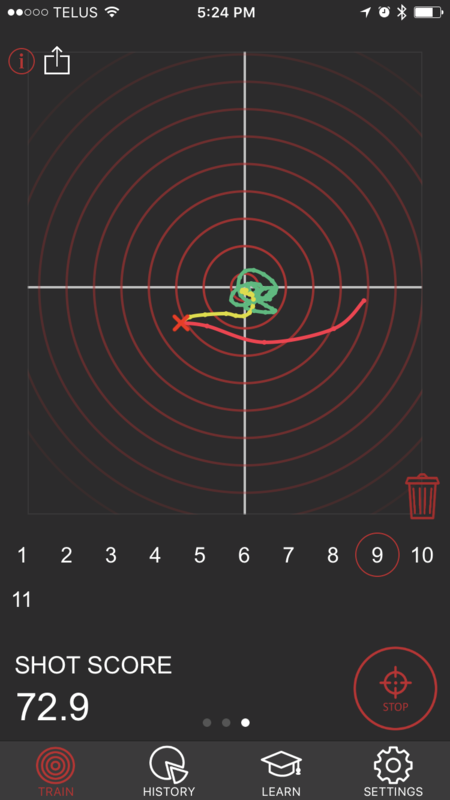 The green is the holding pattern before the shot, yellow is the trigger pull and red is the after shot. This makes what you are doing more visual I find. 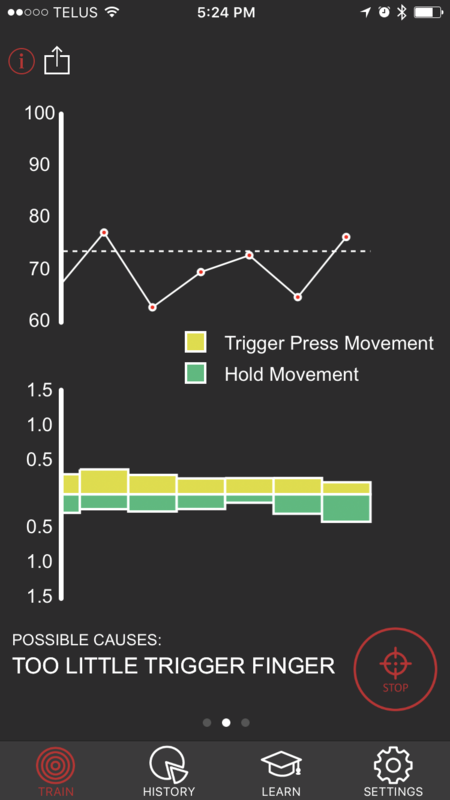 This screen has 2 graphs, once charting the score for all of the shots in the session, and one for charting the magnitude of movement in the holding pattern (green) and trigger pull (yellow). You can also see your total progress over time and your biggest areas that you need to work on. The learn button at the bottom allows you to look and review the recommended issues. 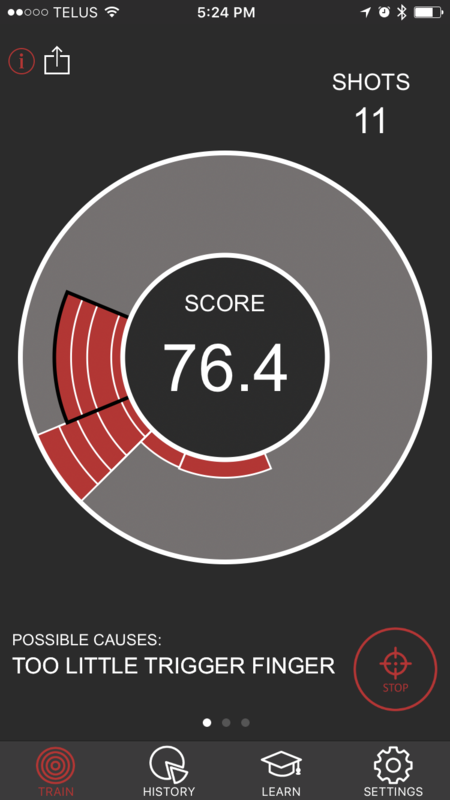 I've seen my scores improve in just a week of use so far, which is pretty cool. It's nice to be able to pop down into my office downstairs and get, actual feedback on trigger pulls. It's nice that it supports a wide variety of platforms, short & long guns, live, dry and Air fired (airsoft/Paintball) so you can get a lot of feedback. I'm really happy with it. It's built solid. I think I would have to hit it pretty hard on a live fire drill to cause any damage to speak of. If you're on the fence about it, I'd say go for it. It doesn't add noticeable weight to your weapon and it gives you an all the time coach providing feedback. Practice doesn't make perfect, perfect practice makes perfect. It doesn't alleviate some training scars from dry fire. I still need to rack my SKS between shots to reset the trigger. My Jericho stays double acting without a round in it, so I still have to take up the trigger each time, but this isn't the MantisX's fault, that is the nature of dry fire. The app is simple, small and does what it needs to without a lot of bloat. It doesn't try to annoy me with pop ups, it just sits there and does its job. No crashes yet. For those days when I can't make it out to the range, this really steps up the dry fire a lot. MantisX's YouTube channel does a great job of explaining how to use it, set up, interpret and there are also a bunch of video reviews and unboxing. Dry Fire is going to be the hardest thing for the MantisX to interpret, as it has the least amount of queue. It's pretty easy to know when an SKS goes off on live fire. Being able to differentiate between racking, dropping mags and trigger pull while executing dry fire is way more impressive in my opinion. I was worried the unit was going to fail pretty hard at this, but I am shocked to say it definitely performed better than I anticipated. If anyone has any questions, comments or concerns, please go ahead and let me know. Because, really, who doesn't like talking about a new piece of kit? 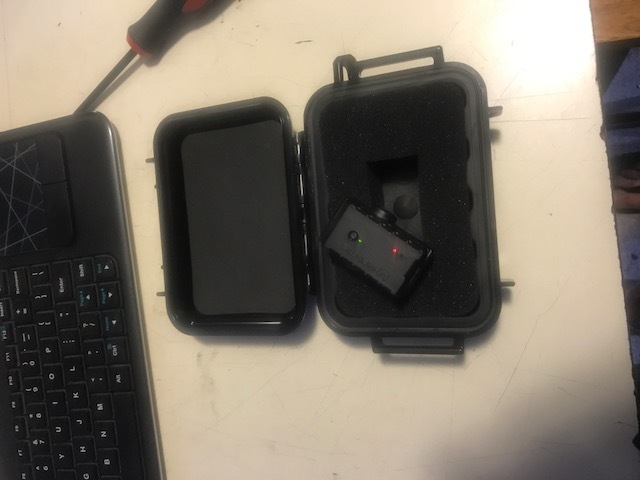 If I can get out to the range and/or paintball field I'll post some thoughts on using the gadget there as well. All good. Glad it helped! Now i'll have to add it to my list of wants. I've been trying to talk myself into one of these since ShotShow. I really, really want one! I've always been really good at enabling people. Call it a gift! The only down side to the system is you don't get actual feedback on your aim, just on muzzle movement. It's pretty easy to find a laser bullet that will correct that however. Update from the range today. 2 things, I wish the battery life was longer, but it charges in 15 minutes or so and the app colours make it difficult to use. And if you close your phone the app turns off. Great review, D! Thanks for taking the time. Edited by ETCGIB, 26 July 2017 - 12:49 AM. Unbeatable Mind - Any thoughts or Reviews?